Btw, when it comes to deciding the emptiness of file, some application might be different than others. For example, some application may consider a file with just whitespace as empty but some may not. The length() method will not consider them empty, which means if you just type space bar in your file it looks empty but it won't be considered empty by your Java program. If you have such requirement then you need to put a special logic which involves reading the file and analyzing content. 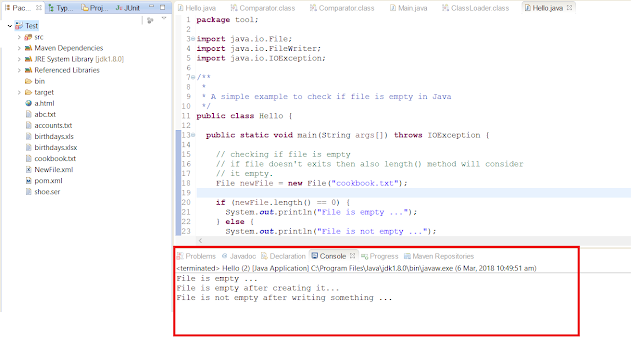 Anyway, in this article, I'll explain to you how to check if given file is empty in Java using a sample program. First, we'll without creating a file. If you remember, File class is used to represent both file and directory in Java but it's nothing but a path. When you say new File("C:\\myfile.txt") it doesn't create a file but a handle to that path. That's why we can create a File object to given path and call its length() method to check if the file is empty or not. After that, we'll create a new file and verify again, this time also our code should say the file is empty because even though the file exists, there is nothing in it. In the last step, we'll write something in the file and repeat the process. This time our program should print the file is not empty. Without any further ado, here is our sample Java program to demonstrate how to check if a given file is empty or not. You can clearly see that when we first checked by creating a File object, we got the File is empty because the file didn't even exist. Remember, a file is not created in Java until you call the createNewFile()method. After that, we checked again but this time also we got the File is empty output because even though the file exists it was actually empty, nothing was written on it. In the third case, we writing one line "Java is great" on file using FileWriter and then checked again. Boom!! !, this time the file wasn't empty which means our code is working fine as expected. You can also copy paste this program in your Eclipse IDE and run and it should print the same output very first time. Well, because after the first run of this program, you should already have a cookbook.txt file in your Eclipse's project directory and it is not empty hence it prints not empty. The createNewFile() method will not override if a file with the same name already exists. Another thing, which you should keep in mind is calling the flush() or close() method after writing something on file. For example, if you remove the flush() method and check if the file is empty or not, you may receive incorrect result i.e. file is empty, even after you have written something on it. Well, because the content may not be flushed to the file when you checked, that's why calling flush() is important before checking. 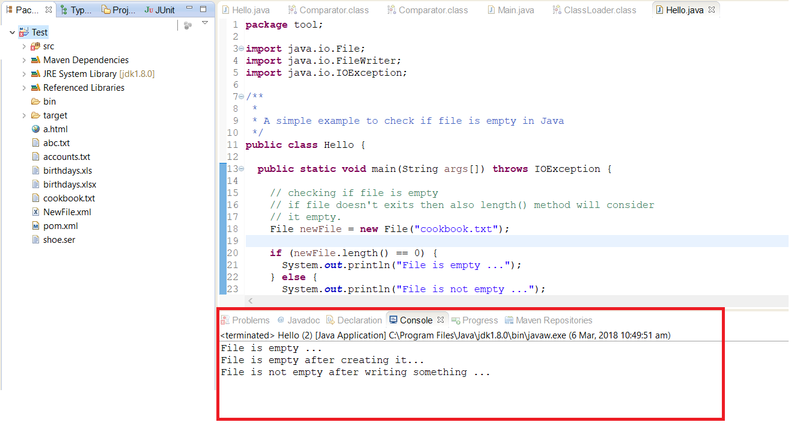 That's all about how to check if a file is empty in Java. You can simply call the length() method without worrying about whether the file exists or not. This method returns zero if the file doesn't exist or file is actually empty i.e. doesn't contain anything. applications, this problem is really important. and we can follow it, because it works. THank you Sinatta, glad you find this tutorial useful. Please share with your friends and colleagues, it helps a lot.